Your business website is your online salesman, available 24 hours a day, 365 days a year. It lets the world know who you are and what you do. 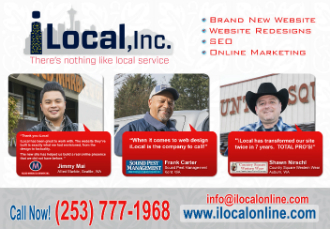 At iLocal, Inc., we offer web design services that Seattle, WA businesses need for a successful online presence. Does Your Website Design in Seattle Needs a Makeover? It seems like web design trends in Seattle change with the seasons. That is because they really do. Chances are that new, glamorous website design you were so proud of a year ago is already outdated. Need to redesign your website? We can take your old website and convert it into a modern, mobile-friendly site at an affordable cost. We will give you a website design that makes it easy for people to do business with you and turns casual site visitors into loyal customers. Visit iLocal, Inc. today at 92 Lenora St Seattle, WA 98121. Why Choose Our Web Designer in Seattle? We strive to perfectly blend creativity and technicality in our website design services. Every project that our web designer works on is unique, both in terms of challenges and goals. With that in mind, our web designer makes every effort to find out the most appropriate solution that helps to trigger your business. Call us on (206) 384-4344 to schedule a consultation with our web designer in Seattle.